In the late seventies as I worked on a master’s degree in agricultural economics, my best friend, who had just entered seminary, encouraged me to undertake study of classics in the faith and early on I read Augustine’s (1978) Confessions. The Confessions proved to be a challenging read both because of my lack of seminary training and because of the old English translation. When I undertook this year to write my own memoir, my friend encouraged me to return to the Confessions both because the Confessions provided a template for all memoirs to follow and because this time I also had seminary training. Convinced of the wisdom to return to the Confessions, I sought a more modern translation that would be easier to read and, to my delight, found a translation by E.J. Sheed with an introduction by Augustinian biographer, Peter Brown. Brown (2000) is revered as one of the leading Augustinian biographers of our time and I had used his biography during my days in seminary. I break this review up into four parts. First, I give an overview of the Confessions and why we are interested. Second, I review the life of Augustine and sin, as he describes it. Third, I will focus on Augustine’s coming to faith. Lastly, I will review his theological writings, which focus on the creation accounts in Genesis. For those unfamiliar with church history, Augustine of Hippo (354-430 AD), which was in modern-day Algeria, lived right after the time of Emperor Constantine the Great (272-337 AD) who made Christianity the official religion of the Roman Empire. Bishop Ambrose baptized Augustine who had such contemporaries as Jerome, who translated the Bible in Latin. The fourth century posed a heady time for the Christian church and Augustine’s theology influenced much of what followed. For example, Martin Luther (1483-1546), a leader in the reformation more than a thousand years later, was an Augustinian monk (Bainton 1995, 25). Of contemporary significance is the point that Augustine hailed from Africa where some of the best theology and early Bible manuscripts were copied. African scholarship dominated the early church and this dominance continued until the Islamic invasion in the sixth century, following the life and work of Mohammad (570-632 AD). The statement that Christianity is a “white man’s religion” (widely touted in developing countries) is not historically accurate and denigrates the significant contribution of African scholarship to the early church. 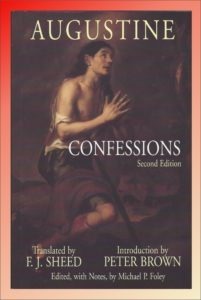 The influence of the Bible on the confessions is obvious to any reader because Augustine frequently begins a particular section in prayer and cites scripture throughout, allusions to which the editor has conveniently footnoted. an act of penance (self-accusation). Today, we primarily assume the last definition (329). I take this statement to mean that Augustine proposes to be frankly forthright in confession so that he can be an example to others. Is it any wonder that people trusted him and followed him into the monastic life? Having read the Confessions as a young man, I truly believe that they helped lead me to live an ascetic lifestyle, even after it was no longer a financial necessity. I commend the Confessions to anyone who wishes to deepen their faith in Jesus Christ. Augustine. 1978. Confessions (Orig Pub 397 AD). Translated by R.S. Pine-Coffin. New York: Penguin Books. Bainton, Roland H. 1995. Here I Stand: A Life of Martin Luther. New York: Meridan Book. Before mechanical printing, manuscripts had to be copied by hand and copyist sometimes “corrected” texts as they reproduced them. African scholars, centered in Alexandria, were much more careful in copying manuscripts than others, including their European rivals (Metzer and Ehrman 2005, 278).